← Should we go ahead? An American Hero to be thankful for. 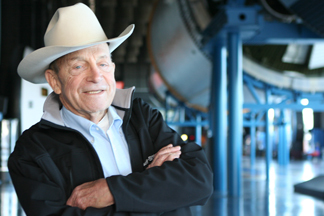 One of the most amazing Americans you don’t know: my cousin Sherman Seltzer who was a hero in the Korean War, worked with Van Braun to get us into space, and has designed systems for satellites, Hubble, space station and more, and was just an Alabama cowboy. And he was awarded the US’s most prestigious aeronautical prizes, the Wright award. Since this was written he has passed away……he was an absolutely humble and amazing human being and one who made our country safer. He doesn’t remember the day Apollo 11 landed on the moon, but he helped it get there. Dr. Sherman Seltzer, a retired aerospace engineer with NASA, oversaw the guidance and control systems of the Saturn rockets that carried man to the moon. Shown here at the U.S. Space & Rocket Center, today he prefers the tranquil life of cattle ranching. Now 83, he catches many of those memories from the porch of his brick ranch house that sits atop a knoll near New Market in Madison County. Down below, he can see his Hereford-Red Angus cattle grazing, and in the distance, Tater Nob rising from the floor of Hurricane Valley. Seltzer is an aerospace engineer who spent a lifetime reaching for the heavens, but there’s no place on earth he’d rather be than here. Here, he can watch his cattle graze and his horses run and kick up their heels. Here, the childhood days on his grandfather’s Montana ranch — and his beloved late wife Lou — somehow don’t seem so far away. If some of his old engineering buddies from NASA (National Aeronautical Space Administration) were to stop by, they may talk about the days spent preparing the Saturn V rocket that launched Neil Armstrong up to his “giant leap” on the moon. Mostly, though, those memories stare back at him from the photographs that adorn the walls of the office inside his home. Photos of Saturn rockets, Skylab, the Hubble Space Telescope, Pershing missiles and Polaris missiles testify to Seltzer’s many contributions to aerospace and defense. A specialist in guidance and control systems, he left his thumbprint in the heavens on more than one occasion. The celebrated rocket scientist Wernher von Braun said as much in a photo he addressed: “To Sherman Seltzer, in appreciation of your fine contributions to the work assigned to the Marshall Space Flight Center — Wernher von Braun.” Next to it hangs a certificate for “Exceptional Scientific Achievement” signed by NASA Administrator James Fields. Above them all hangs a photo of Seltzer as a young soldier with Army buddies during the Korean War — and the two Purple Hearts and Silver Star he was awarded during that conflict. Still, there’s an odd dichotomy to this cluttered little office, a strange mixture of rocketry and ranching. A pair of worn leather chaps are flung across the back of his chair, and paintings by popular cowboy artist Charles Russell compete with NASA certificates and photos for wall space. Aviation magazines share the desktop with beef cattle publications. When Fanning first began tending Seltzer’s cattle, he says Sherm insisted on nothing but purebred Hereford, the same white-faced red cattle his granddaddy had raised back in Montana. In fact, Fanning says, he and long-time Hereford producer Glynn Debter of Horton frequently went to Montana and purchased bulls and cows together. P.D. Nicaise, who first worked with Seltzer on the Pershing missile system, remembers how Seltzer’s farm got its start on lands leased around Redstone Arsenal where he kept a couple of horses and some cattle. Later, he says, NASA engineers would show up at the farm to help round up and brand cattle. “We all laughed and joked with Sherm about being a cowboy, but Sherm’s a technical man. He knows the engineering and the science,” Nicaise said just before relating an incident where Seltzer, decked out in cowboy hats, jeans and boots, wowed the audience at an aerospace industry event with his technical presentation on guidance control systems. But Seltzer, a short man who casts a 10-foot shadow, is far more than a rocket scientist. He’s packed a lot of living into his years, a fact not lost on Nicaise who was so taken by Seltzer’s fascinating life story that he urged him to write his autobiography. He agreed, and sat down with Nicaise for hours to record the recollections in Sherm’s Story, self-published by Seltzer in 2004. The son of an entrepreneurial attorney whose brother is often credited with having created roller derby, Seltzer attended high school in Hollywood where comedian Red Skelton was a frequent visitor at the family’s home. But the Korean War interrupted their honeymoon, and Seltzer soon found himself in an M-24 tank in northern Korea where he “welcomed the Chinese” into the conflict. He received one Purple Heart when a Chinese soldier bayoneted him, and another when a landmine exploded beneath his tank. With broken bones in his legs and his scalp blown off, Seltzer crawled from the wreckage under heavy fire as a fellow soldier held on to his pistol belt. He awoke to a chaplain saying last rites over him. It wasn’t to be. Despite a permanent limp, Seltzer’s Army career continued. After Korea, the Army sent him to the University of Michigan where he earned two master’s degrees in aeronautical engineering and guidance control. Later, he would earn a doctorate from Auburn University. Still, he became fast friends with astronaut Owen Garriott as the two worked side-by-side on the Skylab, the United States’ first space station. Garriott would later visit the station in 1973 — and make several space walks — on the Skylab 3 mission, which lasted almost 60 days. Although Skylab’s orbit ended in 1979, another project that bears Seltzer’s fingerprints — the Hubble Space Telescope — continues to explore the universe two decades after its launch. Between retirements and lecturing, he and his engineering buddies launched —and sold — multi-million dollar businesses in the defense industry, including SVS (Shirley, Van Allen & Seltzer) which today is a subsidiary of Boeing. Dates and names may escape him now, but Dr. Sherman Seltzer, the rocket scientist who guided men to the moon, knows the closest thing to heaven is right here in Hurricane Valley. It’s home. It’s riding his Quarter horses and checking the cattle. It’s sitting on the porch of the home Lou designed, and watching the moon rise over Tater Nob. Seltzer wouldn’t argue with that. Jerry… just came across your blog in which you re-published my article on Dr. Seltzer. Am glad you got to see it and share it, and I hope “Sherm” is doing OK these days. He’s one of the most remarkable men I’ve ever met! Very glad to see your note. Thank you for posting. I am his daughter and he has been the single most positive influence in my life. I am SO lucky! I was a 17 year old kid attending Auburn U as a freshman. I walked into my room and saw this thick man there and to my surprise he was my room mate for the next two quarters. Sherman was a very interesting man and had a very positive influence on me as a freshman. One, I had to study by his example and I worked hard. I would love to drop him a note just to say hello and thank him. Would anyone have his address or email? Sherman lives in Newmarket AL…….his memory is fading fast, but he is listed in the directory and you might want to call him…..I am sure he would appreciate it. Jerry, thanks for the info. I did call him but I do not think he remembered me. This is something I should have done many years ago. I never forgot Sherman and the influence he had on me. Had I had any other roommate at that time in my life, I would probably have partied my way right out of college into the Vietnam War. As it was, I took an ROTC commission like he did and serve after graduation. I am proud to have known your Uncle even if it was for only a short time. He gave a life time of memories and a positive role model. Both he and my father were engineers, both successful in their fields, so he was like another father to me in some ways. I wish him the best. Thank you again. glad you were able to speak with him…..actually, he is my first cousin. I am his daughter. I remember when Dad went away to Auburn…and I still have the little stuffed Auburn Toger he surprised me with one day. Glad to see this note from you! It is fitting that I received your note on Veterans Day. Sherman told me about his experience in Korea and I never forgot them. Of course I saw the scars on him as we were roommates. I remember his uniform hanging in his closet and i asked him about the ribbons and the Indian patch on the sleeve. How it tired in to my Florida history class. He was a true hero and I am sure a great father and husband. And of course, a very smart man. In many ways, he was like my father who was an engineer and very smart as well. Where can I find his autobiography, “Sherm’s Story”, searched Barnes and Noble and everything and cannot find it. It was self published….I have never seen a copy. And today, at 6:45 in the morning Alabama time, he has found peace and rejoined the woman he lived and grieved for, Lou. Jerry, I am sorry to hear about Sherman today. He will be someone I hope to never forget. He is an American Hero who served his country his whole life. God bless him. He was an amazing dad besides everything else. He is the one person in my family who constantly said “you can do it; you can be it” to anything I wanted to do or be. Never mind that nasty little rejection when I tired out for “South Pacific” in the 80’s…:) I sang along from backstage anyway! Sherman was a wonderful person. He was a gentle man with a great sense of humor. I loved his smile, stories, yodeling, and the great love he had for his children, Anne and William. He will be missed by many whose paths crossed his.